I say it�s never too cold to ski. But you need to be prepared. Some of my coldest days skiing include riding the long slow Madonna double chair at Smugglers Notch Vermont with the wind howling and it was -15 degrees. Fun times. 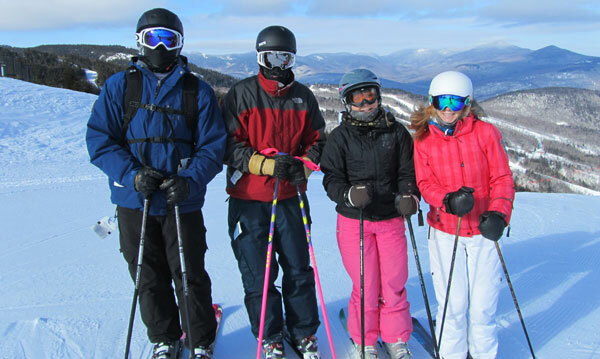 I also recall skiing Sugarloaf with our kids in -10 degree weather. I took the kids inside after three runs � the severe cold was not fit for small people. My husband took all our hand and toe warmers, plastered them about his body, and went back out for a few solo runs. Last year in Revelstoke, British Columbia, the liftees advised us not to ski in the -34 Celsius temps, but we boarded the gondola and banged out some supremely fun (okay, cold) runs. Skiing is an inherently cold sport, it�s a winter pastime. As long as the ski lifts are running, and your gear is good to go � you should be able to enjoy skiing in below zero temps. 1. Start warm. Don�t leave your ski equipment in the car overnight. Frozen boots, gloves, and cold ski pants are not a good way to start a below zero ski day. 2. Keep your car pointed out, with plenty of gas, and the battery charged. This forethought should help your car start even in minus temps. Having your car battery accessible, versus your hood against a snowbank, makes it that much easier to jump start if necessary. 3. Layer up. Base layers made of technical fabric should be moisture wicking while providing warmth. Wear ski socks with smart wool, then long underwear, a fleece or wool layer, and finally waterproof and windproof ski pants and parka. Protect your face with a neck and face mask, or balaclava, and goggles with no gaps to your hat or helmet. A ski parka with a hood that fits over your helmet adds an extra layer from the wind and cold. 4. Hand and toe warmer packets are life savers on super cold days. They are only a buck a pack. I buy them by the case. 5. Fuel up with warm high energy food and drink before you ski. Also, take frequent breaks in the lodge for cocoa, hot water, or tea to keep your insides hydrated and warm. J�germeister or brandy in a flask, while tempting, is actually dehydrating. 6. Make sure your bindings are functioning properly. Extreme cold can freeze the mechanics of the toe and heel release � so pop in and out of your bindings a few times to engage and de-ice your bindings. 7. Use the buddy system on super cold days. This is so you can check each other for exposed skin and frost bite frequently, And you can also keep each other company on those cold chairlifts rides. 8. Be aware that extreme cold changes snow surface conditions. Snow below zero can range from sticky and squeaky to super-fast and unforgiving. You don�t want to crash when its below zero. 9. Choose ski resorts with enclosed lifts for protection and warmth during your ride up. 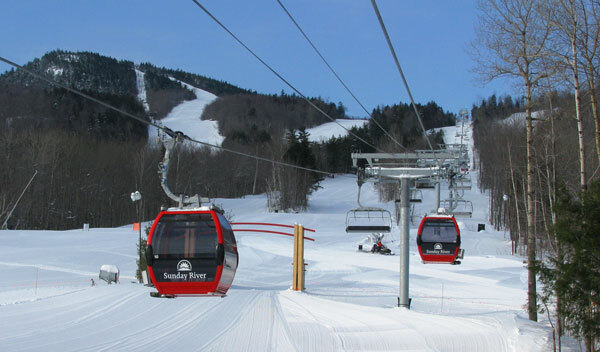 Stowe, Sunday River, Stratton, and Loon have gondolas, Jay Peak and Cannon have trams, Okemo has a heated seat bubble-covered chair lift. 10. Enjoy the un-crowded slopes. Frigid temps scare away the fair-weather skiers, leaving the ski slopes open for you and the few other intrepid skiers and riders.